Once upon a time, Alice Cooper was a group, not a singer and showman. 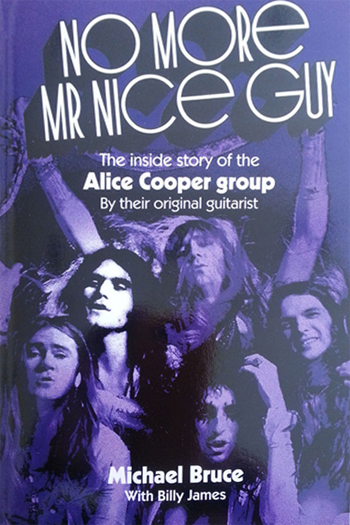 The original Alice Cooper group started out its professional recording career on Frank Zappa and Herb Cohen’s Bizarre/Straight label, and as the band refined its approach and joined forces with producer Bob Ezrin, Alice Cooper (the band) prospered creatively and commercially on Warner Brothers. By 1975 it was long over for the group, as its singer Vincent Furnier fully adopted the name for himself, and went solo. The original band released seven albums of new material (plus a best-of), and those records contain some of the finest rock of its era. If you want to know about that band, No More Nice Guy by the group’s guitarist Michael Bruce is a fine place to start. A highly readable (and quick-reading) tome, No More Mister Nice Guy charts the band’s earliest days through its dissolution from the perspective of someone who was there, and who didn’t do so many drugs that he’s forgotten it all. Bruce’s book is funny and interesting, written (with the help of Billy James) in a conversational style that focuses on the stories and personalities. Typically in an autobiographical book such as this, the post-fame years – if they’re covered at all – make for less interesting reading. But in Bruce’s case, the stories about what he did after Furnier broke up the group are worth reading about. Most readers won’t be familiar with the music Bruce made post-Alice Cooper, but his stories surrounding that music are entertaining, and they make sense into the overall narrative. The book is packed with photos (though unfortunately they’re in Xerox-copy black-and-white) and there’s an occasional unfortunate typographical error (the author’s own first name is misspelled in a photo caption), but neither of those compromise the overall quality to a serious degree. Michael Bruce doesn’t pull any punches when describing the problems with certain band members, but he does so in a largely agenda-free manner that is at once believable and engrossing. His descriptions of the music he and he band mates created will likely send readers back to their worn copies of Easy Action, School’s Out and Killer. Recommended.